I’m not yet a pro when it comes to decorating but I love learning more about it. I started learning more about how to decorate when I decided I wanted to make a cake for Levi’s 1st birthday. But the first time I actually practiced decorating was in June, a week before Levi’s birthday, when I made a cake for my sister-in-law’s graduation. She loved it and I wanted to learn more. 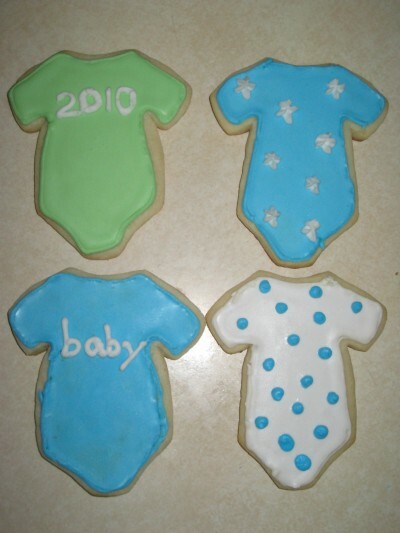 In September I came across these onesie cookies at Annie’s Eats. It was so adorable! I decided to learn all I need to know so I could make them for my upcoming sister’s surprise baby shower. I’m so glad I did. She loved it! Since then I’ve decorated a lot of cookies and I love how it looks so nice and how happy it makes people. Decorating with royal icing isn’t as hard as it sounds. 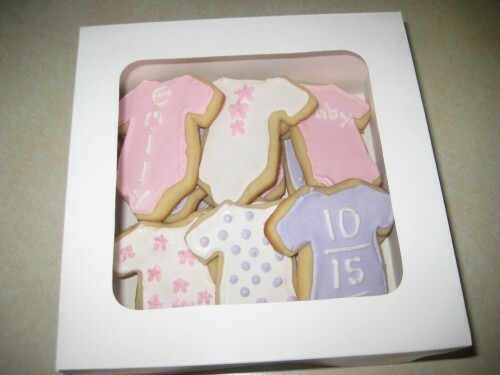 It is a little time consuming but well worth the effort because your cookies will look professional! Combine all ingredients in the bowl of a stand mixer fitted with the paddle attachment. Mix on low speed until the sheen has disappeared and the icing has a matte appearance (about 7-10 minutes). Transfer the contents of the mixing bowl to an air-tight container. This will be the stiffest consistency of the icing, and at this point it is still too stiff to use for decorating. Add water a very small amount at a time and stir by hand until fully incorporated. Continue until the icing has reached a consistency appropriate for piping. (Remember, if you are having any difficulty piping, it is still too thick. Add a little more liquid and try again. 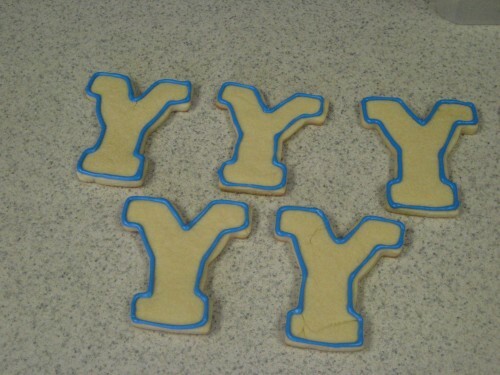 )Using a pastry bag, pipe around the edges of each cookie. Let stand so the icing will set. Make sure to keep the leftover icing covered at all times when not in use so that it does not begin to harden. 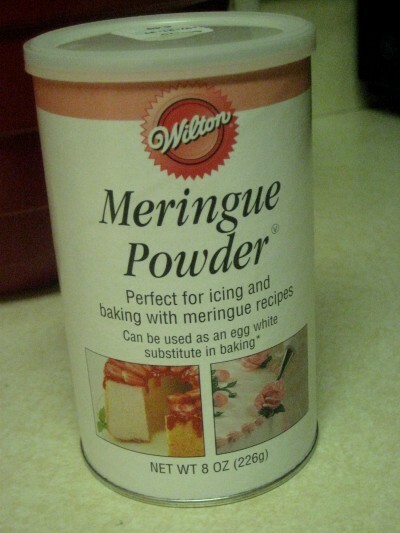 This is Meringue Powder. You can find it at craft stores such as Michaels or Hobby Lobby. 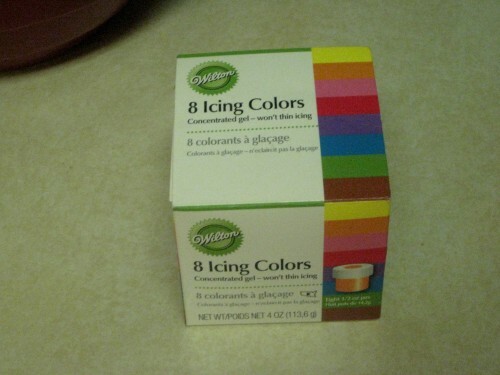 These are icing colors. 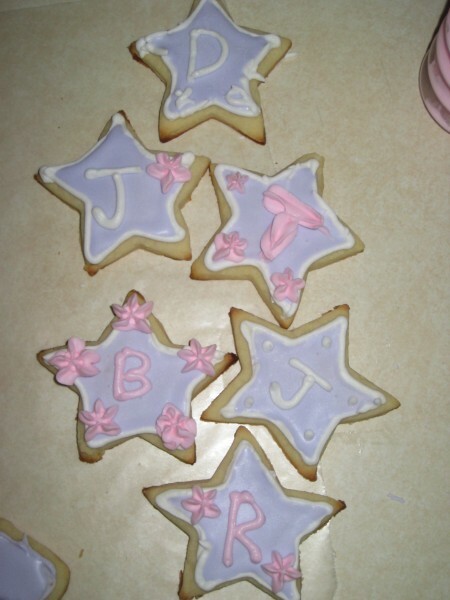 Basically it’s the same thing as food coloring just instead of liquid it is gel so it doesn’t thin out the royal icing. Again, you can find this at any craft store. First step, after you have made the royal icing and tinted it the color you want, pipe on the edges and wait until dry. The next step is to flood the cookie. To do that you take the icing and add a small amount of water at a time until the icing runs off the back of the spoon. Let stand 10 minutes to let the air bubbles come up then pop them and add to a squeeze bottle. Squeeze on the icing then take a toothpick to spread out the icing to the edges. 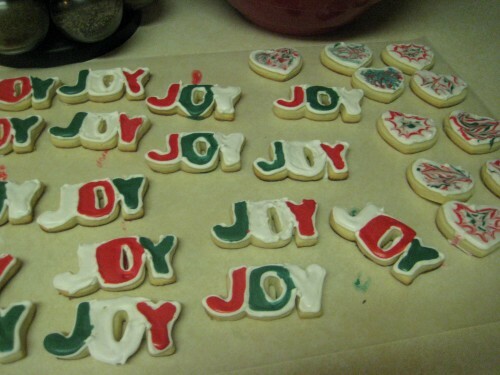 The last step is to let dry and then either decorate them or they are ready to go! 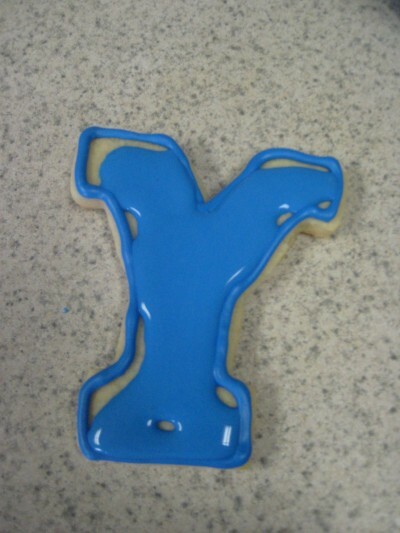 I made these Y cookies last weekend for the BYU game. It wasn’t much work and it was a hit! The first ones I made for the sister’s surprise baby shower. I gave it as part of her gift. 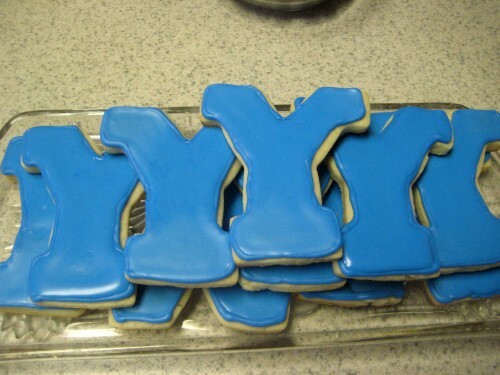 I made these for a friend’s baby shower for all the guests. 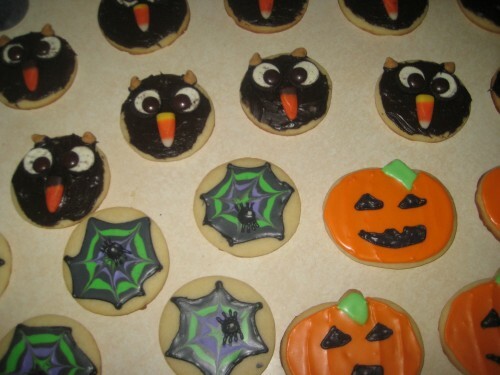 One more note, since it can be a bit time consuming I like to make the cookies the day before I decorate so it doesn’t take up too much time. The cookie is still soft and then you don’t get tired of it and it makes it more fun. 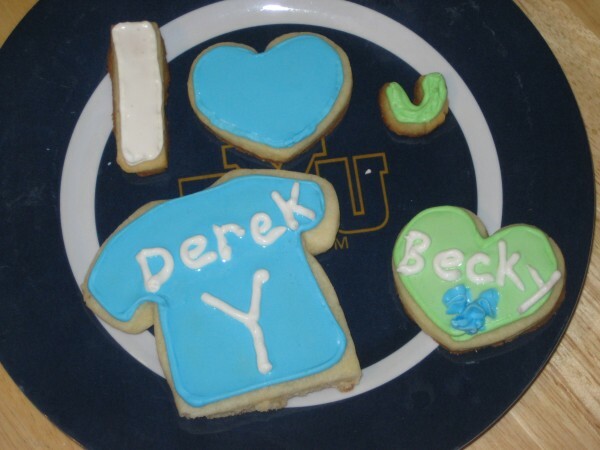 This blog reminded me of the times when our children were young and Maureen would bake up sugar cookies and various holiday shapes and provide the decorating frosting and tools and let them decorate their own cookies. A pleasant memory. Thanks so much for the comment! Please come back and check out more recipes and show me how they turn out! Because I am so new to this and don’t have too many followers I wanted to know where you came across my blog? That would be a HUGE help. Thanks. And WONDERFUL royal icing skills. That’s looks too tough for me. I thought that might be it. When I checked my email this morning and saw that post I nearly flipped. It was so awesome meeting her and Amanda. If you don’t know Amanda form KevinandAmanda.com you need to go check it out! She’s equally adorable. Thanks for the kind words about my blog. I just started as well, back in Septemeber I believe. Its been really fun so far. I plan on keeping it up. Take care and I’ll hopefully see around the blogosphere soon! Way cool! And they taste amazing too! Love ya.